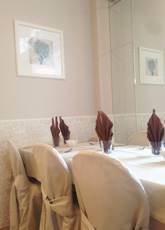 Our hotel restaurant you can enjoy the typical local cuisine, treated in detail. From morning to evening, the restaurant will offer tempting proposals of any kind with excellent buffet made by our expert chefs. Particular care is taken to the variety of foods and dishes that enrich the daily menu. The breakfast buffet (sweet and savory) and cuisine, prepared by the owners, is first rate. More than 20 courses are presented on the buffet lunch and dinner to enjoy more fresh summer proposals and fish typical of Romagna. Each day there will be different types of dishes based on fish, meat and tantalizing specialties from Romagna. Ardea 3 star hotel with restaurant in Riccione each holiday is marked by a touch of originality that involves all our staff in preparing the buffet Sunday to assure the maximum satisfaction during your stay.